Many westerners do not understand why it is that Shia Muslims mourn the martyred Imam Hussein as though the event did not occur a thousand years ago but as if it happened as recently as yesterday. 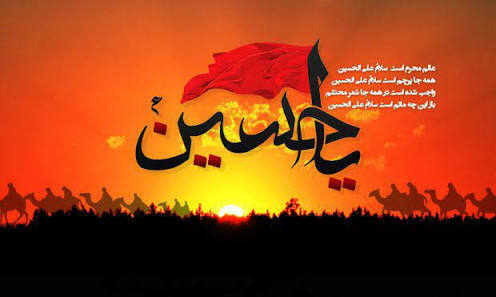 The 10th day of Muharram, Ashura, marks the martyrdom of the third Shia Imam, Hussein ibn Ali, in the year 680 CE/ 61 AH. Shias beat their chests, cry and mourn, because Ashura is a sad, sad story. It is a story of cruelty, loss and grief; a story of love, faith and courage. Hussein (PBUH), the son of the first Shia Imam and the grandson of Prophet Mohammad (PBUH), along with 72 of his faithful companions, fought the army of the Umayyad caliph Yazid bin Muawiyah who had no reverence for the Ahl al-Bayt (the Infallible progeny of the Prophet) and did not adhere to Islamic values. One needs only envision the events leading to and of that painful day and it will be a mystery no more.The heat and thirst have drained the children, their questioning gazes asking what their lips dare not speak for fear of embarrassing the Imam, who cannot quench their thirst as the enemy has ruthlessly prevented man, women and child from the water of life. The Imam's brother Abbas volunteers to bring water for the camp. He advances toward the river Euphrates to fill his water sack, his fingers touching the cool surface of the water. He does not drink although every fiber in his being cries out to him to relive his thirst. The enemy attacks and Abbas loses an arm. He picks up the water sack with his remaining limb and when that is severed he picks it up with his teeth but he is knocked out of the saddle and a blow to his head leaves him with no power to move. He calls to the Imam, 'Brother, where are you?' The Imam fends off the enemy and rushes to his brother's side, holding Abbas, who has been blinded, in his arms until he draws his last breath. The baby Ali has no strength left to cry and no more water left in his body for tears. The Imam decides to reason with the enemy; surely they will understand that a father cannot watch his child wither away in front of his eyes and do nothing; surely they will be moved upon seeing the six-month-old Ali's condition. Imam Hussein faces his enemies and shows them Ali, telling them he doesn't seek water for himself but for the children. He tries to persuade them, but to no avail; hostility radiates in their every response. The sound of an arrow pierces the air and there is a shower of crimson rain.The baby's body shakes no more with dry sobs. The Imam looks down and sees the arrow in the infant's throat. Ali needs water no more. The Imam fills his hand with the lifeblood of his son and throws it to the skies, crying 'Allah, please accept this small sacrifice from me.' How much pain can one person bear? How much loss can a person tolerate? Imam Hussein's sister Zaynab has to be calm so as not to worry the Imam. She must conceal her anguish and give strength to all the women in the camp who look up to her. If she breaks down, so will they. Instead, she displays strength, and carrying the weight of the world on her shoulders, never showing the slightest hint of weakness. She has watched the torn bodies of her sons brought in one by one, her limbless brothers one after the other, and not a word of complaint has escaped her lips. She has been the same calm Zaynab whom everyone turns to in their moments of despair. When the grief is too hard to bear, she only says, 'The will of Allah is my will.' She is atop the hillock overlooking the battlefield now, watching her pillar of strength, her beloved brother, racing toward his destiny of martyrdom as was prophesied so many years ago. She follows her brother with her eyes, feeling the pain of every sword blow he receives. It is almost too much to take and she drops to the ground only to stand tall again. He races toward the enemy and her heart races after him. Her legs again give way beneath her when she sees five-year-old Abdullah, who has slipped out of his mother's grasp, racing toward the battlefield. The little boy is running to his uncle, trying to make his attackers stop delivering blows. His childlike logic tells him he will be able to overpower the assailants and make them leave his uncle alone. Abdullah reaches his uncle and tries to protect his body with his small hands, but blades do not understand reason. Blood is gushing from the little boy's severed hand and he starts crying but is not willing to abandon his uncle. The Imam is near the end and has little strength left to comfort Abdullah. 'It's alright, little one…we will join your father and mine soon...soon we will be free,' he consoles the terrified child. The attacking horde, not satisfied with shedding the blood of the Imam, raze the camp of defenseless women and children, set fire to tents, flog the petrified survivors and loot what they can lay their hands on. The children run across the thorn-covered sand with nowhere to escape and no one to turn to. Possessing not a whiff of humanity, the savages revel in the havoc they have created.The Ahl al-Bayt's suffering and agony is not yet over, as they will be forced to walk barefoot to Damascus. The camp, which has lost all, is forced to walk behind as the decapitated heads of their fathers, brothers and husbands precede them on spearheads. One need not be Shia or Muslim to be moved by the horrific incidents of those sorrowful days. The tragedy of Ashura will leave a permanent mark on the soul of any free and compassionate spirit, regardless of religion or race.